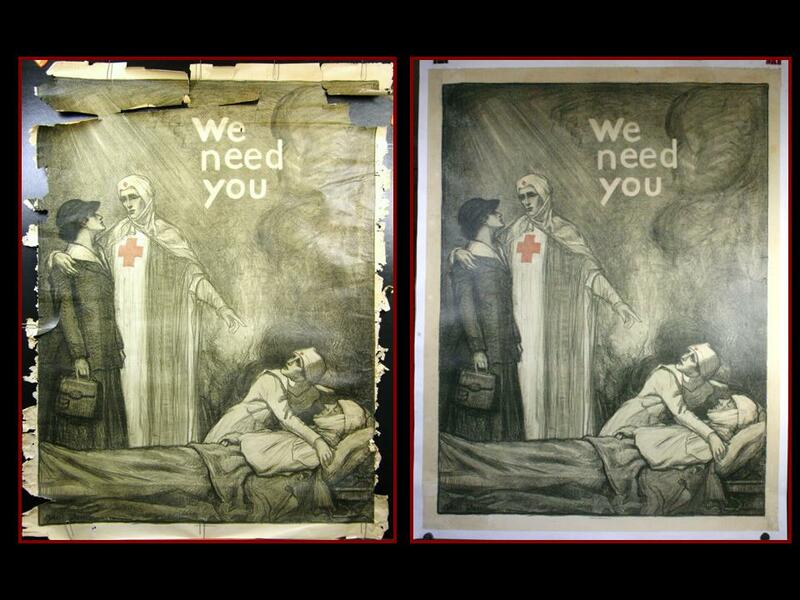 Poster restoration is OPTIONAL and entirely dependent on your tastes and budget and usually follows linen backing. 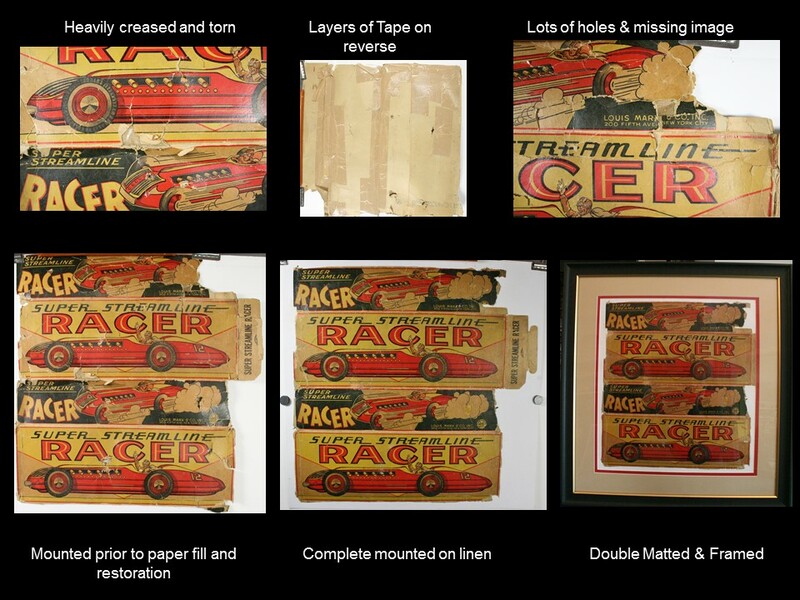 Some collectors prefer no restoration at all and like to see the original “patina” as a testament to the age of the poster for example a frayed margin or light toning arguably adds character to a poster. Other collectors and decorators prefer a cleaner look with none of the imperfections that come with time. Posters, like antiques, that are in really good original condition command much higher prices than an identical piece in average or good condition. Our philosophy is guided by simple principle that any antique, collectible or poster that has been over restored or incorrectly restored may actually decrease the intrinsic valuation of an item and may reduce its appeal to collectors. Restoration in its simplest form would include light retouching to loss of color along fold lines. At the other end of the extreme a poster that has become brittle and too fragile to handle and has multiple tears and cannot be displayed safely must be linen backed and restored for it to have any inherent or decorative value. The examples below are some pieces that belong to clients that received extensive restoration. To find what should be done or how much the cost would be for your piece feel free to Contact Us us with your questions. Most posters that we linen back require little to no restoration and fall into Tier 1 or Tier 2 category (see table below) but for those people considering going the extra mile to save a piece here is a guide to help you get in the ball park. Please understand that this is only a guide and the best way to get a firm quote is to contact us at [email protected], we will try and respond within 48 hours. If you are in the Houston, Texas area you can call our poster gallery at the Limited Edition number 281-391-1993 to make an appointment. Keep in mind that the price estimates below are for a standard US 1 sheet – prices with be higher for a larger poster and less for a smaller size. Click Here to see examples of Tier 2 Restoration. Visit our Customer Testimonials Page.